The search for water resources in China and India has persistently been a source of tension between both countries. Current efforts on behalf of China to divert the water resources of the Brahmaputra River away from India will compound a situation that has remained tenuous since the 1962 Indo-China war. The melting glaciers in the Himalayas as a result of increased global climate change will have a dramatic effect on this river's water supply impacting agrarian livelihood and increasing floods which will likely bring relations between both countries to new levels of anxiety. In 2000, India accused China of not sharing hydrological data on the flow of the Brahmaputra River through the Chinese territory resulting in widespread devastation and floods. At least 40 people died. A Memorandum of Understanding was signed in 2002 to coordinate data sharing pertaining to water level, discharge and rainfall. The data provided by China has helped in flood-forecasting and given the Indian Water Ministry a better understanding of the river system. Any plan to divert the Brahmaputra will have to be made known to the Indian Water Ministry beforehand in accordance with the Memorandum of Understanding. The concerns over plans to divert the Brahmaputra were not ill-placed by Indian officials. The two components of the diversion scheme would include the construction of the world’s largest hydroelectric plant on the Great Bend of the river on the Tibetan plateau; the second is the diversion of the waters northward across hundreds of kilometers to China’s northwestern provinces. In early 2003, scientists from the China Water Conservancy and Hydropower Planning and Designing Institute organized a feasibility study for a major hydropower project along the section of the Brahmaputra River which flows through China. This section of the river, which later flows into India and Bangladesh, is calculated to have a water energy reserve of about 68 million kilowatt, or 1/10th of the national total. If successful, this project would divert 200 billion cubic meters of water annually to the Yellow River. Although highly beneficial for Chinese interests, the effects on India and Bangladesh will be devastating. Environmental experts report that roughly 60% of the total water flow will fall drastically if China is successful in constructing this dam on the Brahmaputra. China’s effort to redirect the flow of a river which provides the base for agrarian life in its neighboring countries is a bold move, indeed. Some have gone so far to say that this action qualifies as an act of war. In fact, this is another grand effort on behalf of the Chinese government to fulfill its goal of instituting a massive South-North water diversion project. 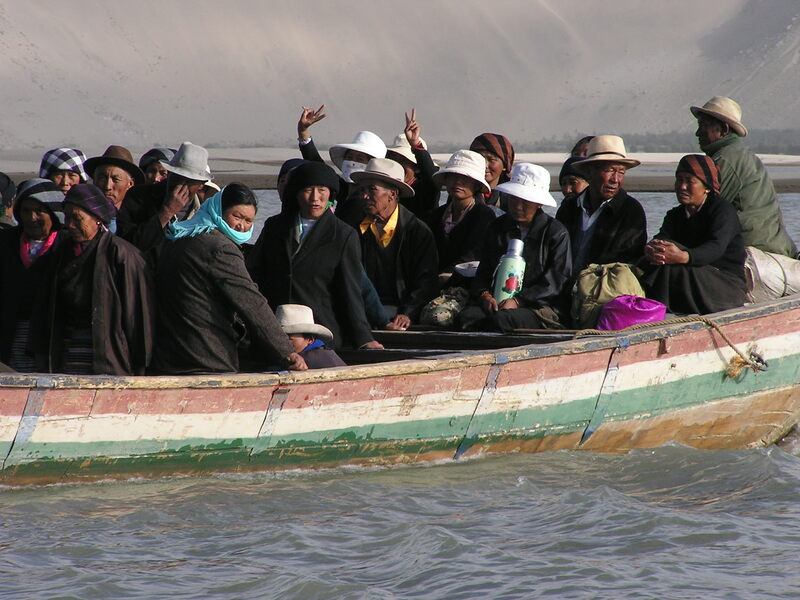 In 2006, the Chinese government denied planning to divert water resources from the Brahmaputra to provide fresh water for the Northwest provinces away from India and Bangladesh. Although top water officials denied this motivation, it has been a fear of the Indian government and has yet to be fully resolved. The incredible growth rate of China’s population (predicted to reach 1.6 billion in 2045) and the rapid urbanization of major sectors of its populace will exacerbate one of the country’s greatest concerns, the availability of water to meet the needs of its people. Current numbers estimate that China has only 8% of the world’s fresh water to meet the needs of 22% of the world’s people. To further compound this problem, the country’s water resources are not equally distributed. Southern China, with roughly 700 million people, has 4/5th of its water and northern China, with 550 million people, has 1/5th of the water. In the map above, the three red lines indicate China's water diversion projects. The route across the Tibetan plateau will be the most controversial as it redirects the natural flow of water away from countries such as India and Bangladesh. The scheme to divert the waters from the South to the North was crafted based on this understanding of water distribution. As evidenced in the following map, there are three critical segments: the eastern, central and western routes. Due to the proximity to the Indian border, the scale and impact of this water diversion scheme will have dangerous consequences for millions of people downstream. The foremost concern is the decreased water flow which will impact irrigation practices and local livelihoods. The environmental impact will result in an increased salinity of the water. As tensions grow between China and India over river diversion projects and accessibility to fresh water resources, the likely impacts of climate change on this conflict over natural resources will amplify the current state of affairs. Primary concern needs to be placed on the possible changes in magnitude, extent and depth of floods from the Brahmaputra River in India and Bangladesh. The gradual melting of Himalayan glaciers as a result of climate change will impact the amount of water in the Brahmaputra. 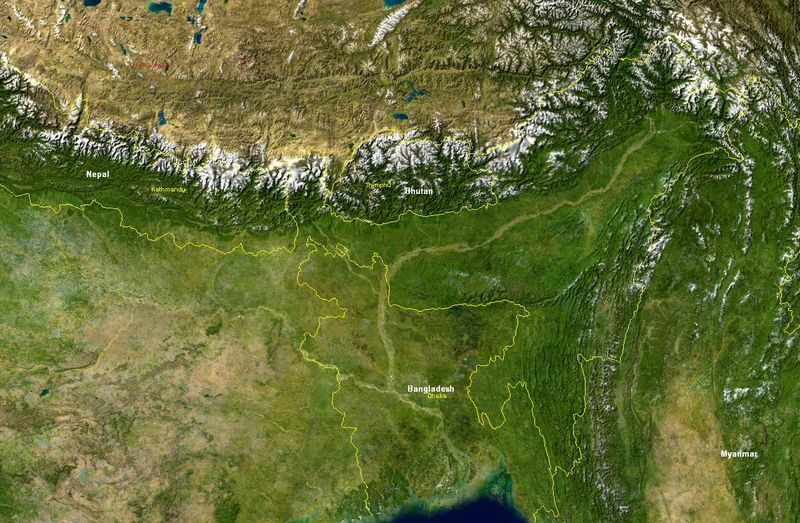 As the ice disappears, so will significant fractions of south Asia’s water supply. As the Brahmaputra river dries up, along with other rivers critical to the survival of India, gross per capita water availability will decline by 1/3rd by 2050. The feedback loops that result from massive declines in water availability are directly correlated with human health and may result in a rise in water-borne diseases such as cholera. Rather than covertly acting to divert water resources from one country to another, the protection of the shared resource of water supply might be a focal point of cooperation rather than conflict. China and India could work together to protect surrounding communities from increased flood hazard due to climate change by strengthening flood management policies and adaptation measures. The conflict over the Brahmaputra will begin in 2009 as China begins construction on the world's largest hydroelectric project. As the impacts of climate change increase, the level of conflict will follow suit, and could continue well past 2050. The central actors will be government actors supported by the state of India and China, as well as each of their standing militaries. In addition, civilian actors will be central to this story, as their access to water and their livelihood will be a critical metric of this conflict. The impact of global climate change is the central back drop of this conflict case study. Although a water conflict may have been a likelihood in future years between these two countries, the projected impacts of climate change make it a likelihood. The Intergovernmental Panel on Climate Change (IPCC) In the 2007 “Summary for Policymakers” it is noted that mountain glaciers and snow cover have declined on average, contributing to sea level rise – which has risen at an average rate of 1.8mm per year over 1961 to 2003. The region of western China and Northern India share similar bio-geographic types, notably Tibet varies from sub-tropical, to tropical, to temperate. This conflict will take place between states. Presumably the central actors will be China and India; however Bangladesh will most likely become involved due to its location. Conflict over the Brahmaputra River will be high at both the intrastate and interstate levels. The main reason for high intrastate conflict will be over availability to water between villages and communities, which may lead to hording and violence. This is less likely than the most definite interstate conflict which will take place between India and China as the two will have various reasons to take arms against one another – climate change may cause draughts throughout the western provinces of China, it will also melt the glaciers that feed the Brahmaputra River, gradually decreasing the total water supply. Decisions to route the direction of the River toward one country over another will be cause enough for high levels of conflict and will be further compounded by the impact of climate change. The civilian fatalities will easily outnumber the military, even though the military fatalities will be easier to measure and quantify over time. If water is routed from one country to another and the effects of climate change are most extreme – causing internally displace persons, scarcity and drought, and flooding from melting glaciers – the civilian casualties will easily reach 1,000,000 between India and China. The Brahmaputra River has been prone to dangerous floods and erosion that create mayhem on a near annual basis bringing devastation to many communities. Since 1950 flood damage has taken its toll, killing 156 people and washing away 30,900 houses. As a result of climate change, melting glaciers and rising sea levels will dangerous conditions for inhabitants along the flood-prone regions of the Brahmaputra. If this expected increase in flooding takes place, it will have a direct impact on water resources and agriculture. It has been noted that the greatest single casualty due to recurrent floods, accounting for as much as 75% of total flood loss, is the agricultural sector which is the mainstay of the Indian economy. The compounding pressures of water and agricultural scarcity may create further tensions within the country and could lead to dangerous disputes over resources. This will range from regional to state, with the potential of being a multilateral issue. The interests involved will be at the country level, but the resulting efforts at quelling the level of conflict between these two countries may be moderated by multilateral organizations that have had experience with water scarcity and resource allocation efforts such as the United Nations. Over the long term, this issue will lead to a compromise between China and India due to the fact that at the highest level of escalation, nuclear war, there is a need for compromise. As both countries have the capacity to inflict the highest form of damage, that being nuclear, an eventual compromise will have to be reached even though the initial outcome will be victory for China as it reroutes most of the River to conclude in its favor. "Feasibility Study on Brahmaputra Power Project"
"Climate Change Will Devastate South Asia"
Zaman, M.Q. “Rivers of Life: Living with Floods in Bangladesh” Asian Survey, Vol. 33, No. 10. (Oct., 1993), pp. 985-996. Shiva, Vandana. Water Wars: Privatization, Pollution, and Profit. South End Press, Cambridge MA. 2002. McDonald, Bernadette. Whose Water Is It? The Unquenchable Thirst of a Water-Hungry World. National Geographic Society Press. Washington, D.C. 2003. Pearce, Fred. When the Rivers Run Dry: Water – The Defining Crisis of the 21st Century. Beacon Press, Boston MA. 2006. Ling, Li. 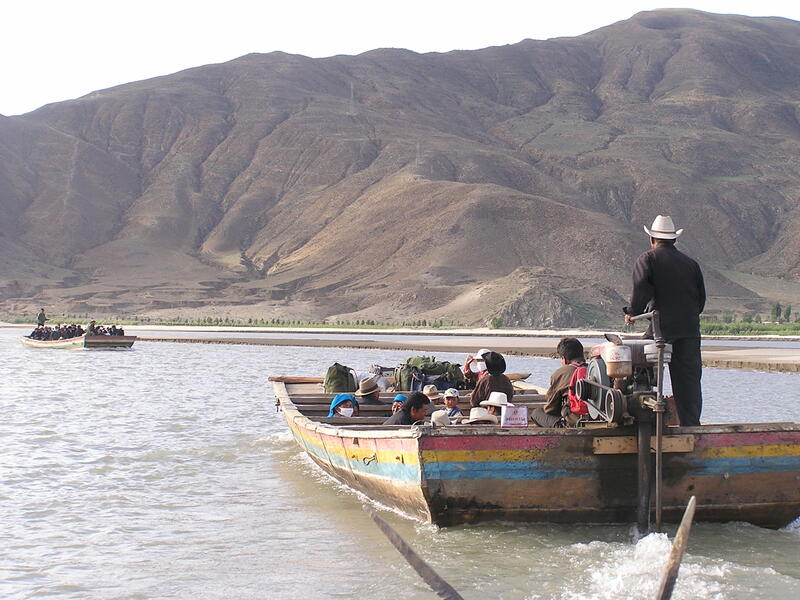 How Tibet’s Water Will Save China. 2006.